Historical * Spiritual * Human * this portrait of a thrice anointed king is a moving journey back into the time of the living Bible. Born around 1000 BCE, David was the youngest son of Jesse of Bethlehem. A shepherd boy, David learned survival protecting the family flocks from wild beast. 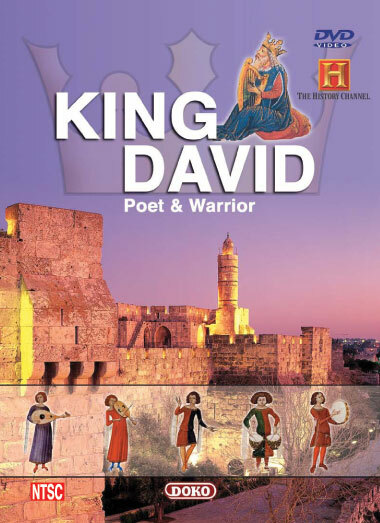 When the Lord's favor turned from King Saul, the Prophet Samuel secretly anointed David as the future king of Israel.With intelligence and charm - but also ruthlessly ambitious - David at first served Saul as harpist and armor-bearer. Then as the battle with the Philistines went against them, David stepped up to go into single combat against Goliath. Armed only with a sling and his faith in God, David slew the giant with a single stone. With his popularity outshining the King's, Saul sought to kill David, but the lad escaped to the wilderness. Upon Saul's death, David was publicly anointed - first as King of Israel then as King of the united monarchy of Israel and Judah. Seeking a new center for his newly united realm, David captured the hilltop fortress of Zion, brought the Ark of God's Covenant there, and made Jerusalem the eternal capital of the Jewish people. After serving God and nation for forty years, David died at the age of seventy "and was buried in the city of David". Saul, Samuel, Hiram of Tyre. Abigail, Bath-sheba, Jonathan, Michal, Joab, Absalom, Amnon and Tamar Amalekites, Ammonites and Syrans, these are just some of the figures and peoples you will meet in this astonishing film.